German cantor, musician, and composer; born in Russia Dec. 26, 1834; died at Gothenburg, Sweden, March 7, 1894. His father destined him for the rabbinate; but his love for music and the song of the synagogue caused him to elect the cantorate. At an early age he emigrated to Germany, and there under the tutelage of eminent ḥazanim prepared himself for his sacred calling. 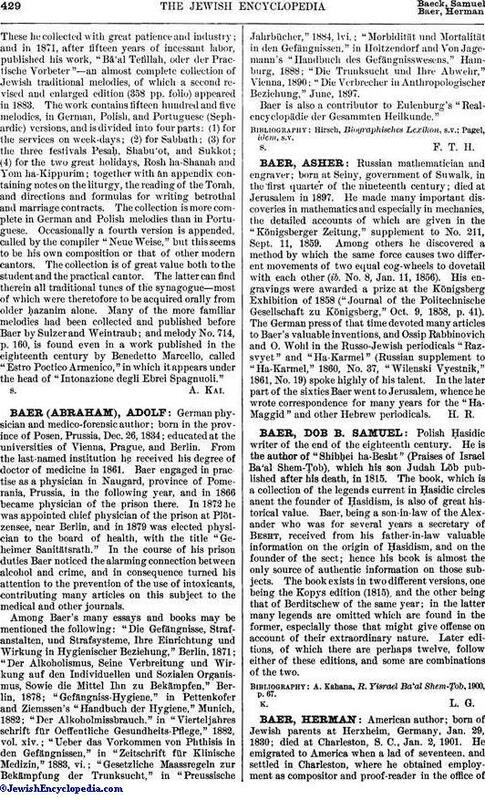 He officiated for a time at Pakosh and Schwetz in West Prussia, and at twenty-three (1857) was called to Gothenburg, Sweden. Well equipped with Hebrew and Talmudic learning, he applied himself with remarkable success to the acquisition of secular knowledge and the science and art of music. 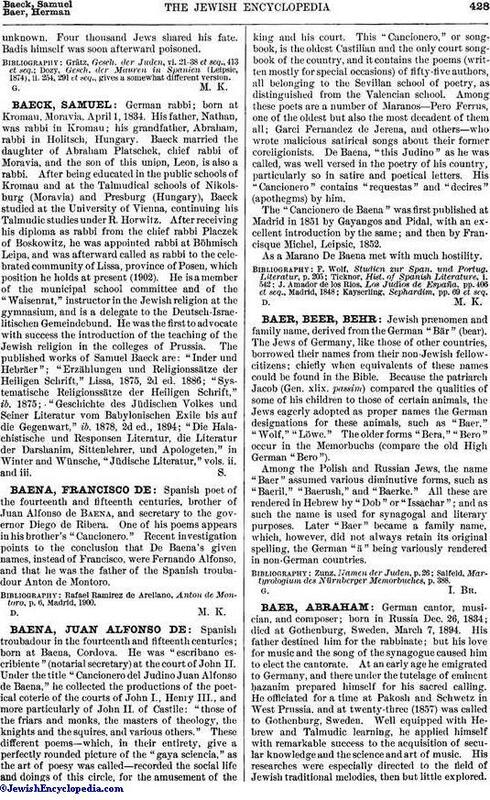 His researches were especially directed to the field of Jewish traditional melodies, then but little explored.These he collected with great patience and industry; and in 1871, after fifteen years of incessant labor, published his work, "Bā'al Tefillah, oder der Practische Vorbeter"—an almost complete collection of Jewish traditional melodies, of which a second revised and enlarged edition (358 pp. folio) appeared in 1883. The work contains fifteen hundred and five melodies, in German, Polish, and Portuguese (Sephardic) versions, and is divided into four parts: (1) for the services on week-days; (2) for Sabbath; (3) for the three festivals Pesaḥ, Shabu'ot, and Sukkot; (4) for the two great holidays, Rosh ha-Shanah and Yom ha-Kippurim; together with an appendix containing notes on the liturgy, the reading of the Torah, and directions and formulas for writing betrothal and marriage contracts. The collection is more complete in German and Polish melodies than in Portuguese. Occasionally a fourth version is appended, called by the compiler "Neue Weise," but this seems to be his own composition or that of other modern cantors. The collection is of great value both to the student and the practical cantor. The latter can find therein all traditional tunes of the synagogue—most of which were theretofore to be acquired orally from older ḥazanim alone. Many of the more familiar melodies had been collected and published before Baer by Sulzer and Weintraub; and melody No. 714, p. 160, is found even in a work published in the eighteenth century by Benedetto Marcello, called "Estro Poetico Armenico," in which it appears under the head of "Intonazione degli Ebrei Spagnuoli."